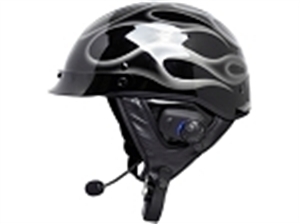 Sena Bluetooth headsets are renowned for their ease of use and functionality. Devices like the SMH10 allowed gloved riders to use Bluetooth devices by employing a control knob in place of small buttons, and has continued the tradition by making all their devices dangerously easy to use proficiently. Sena is currently one of the only companies that make a Bluetooth device capable of streaming live to two receivers, a device employed frequently by rider/passenger pairs to enjoy the same music. In addition, Sena is pairing with helmet brands such as Bell to develop integrated helmet headsets right out of the store! If you’re looking for a quality, easy to use headset, then look no further than here.